Increased Signup Bonuses for the Scotiabank AMEX and RBC BA Visa! Along with the improved offers for the TD Aeroplan Visa Infinite and TD Visa Infinite Privilege, other issuers are also upping their game. Scotiabank Gold American Express – Earn up to 25k points! Last year, I wrote about how to earn up to 4% on all purchases, by leveraging prepaid and reloadable cards. This is the one of only two cards in Canada that allows you to do that – the other being the Scotiabank Momentum Visa Infinite. In fact, you can earn 5% cashback on your first $3000, but that’s kind of limited. Additional Reading: Get up to 4% on all purchases – with manufactured spending! With the Scotiabank Gold American Express, you will earn 4 points per $1 on the first $50,000 in net purchases per calendar year at gas stations, grocery stores, restaurants and bars, and entertainment. This is per calendar year, so in the first twelve months of card membership, you can earn up to $4000 cashback (on 100k). However, this offer is not bad by itself, even if you don’t do any manufactured spend. You earn 25,000 points after $750 of spend within the first three months of opening the account, along with a first year annual fee waiver. That’s $250 of travel, free. 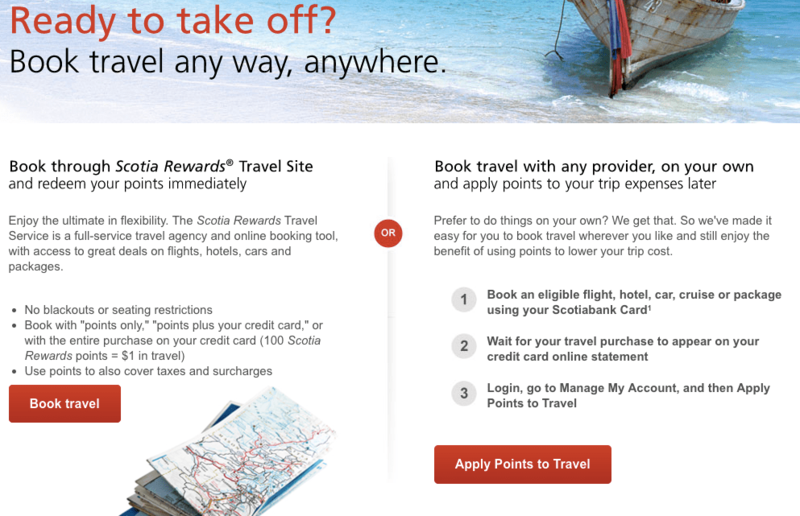 Scotia Rewards is great in that you’re able to book your own travel and then apply points to offset the purchase, which means you can use this on items like the taxes and fees on Aeroplan reward tickets (because they post as an Air Canada charge), so your awards are $0 out-of-pocket. Redemption is straightforward and can be done online. This offer is valid until July 31, 2017. RBC British Airways Visa Infinite – Earn up to 50k Avios! RBC issues the co-branded BA Avios credit card. Once or twice a year, the signup bonus is increased from 15k to 50k Avios, which is pretty good for a co-branded card in Canada. These transfer at a 1:1 ratio, so if you grabbed the Visa as well as the American Express Business Platinum Card, you could earn up to 135,000 Avios after meeting minimum spend. That’s a lot of weekend vacations! Unfortunately, there are two components that this offer less attractive. First, the annual fee is not waived, and is $165. As well, only 15,000 points are awarded on approval; $9000 of spending is required in the first three months to get the other 35,000. This is quite steep – although there definitely are ways to push purchases upfront to satisfy the minimum spend requirement. This offer is valid until May 31, 2017. What Other Credit Cards should I Get? Any Canadian collector is going to have Aeroplan as one of their primary programs, so the TD Aeroplan Visa Infinite is a good way to bulk up your account balance. Then, the AMEX Gold card lets you top up either your Aeroplan or Avios balance at a 1:1 ratio. These cards have the highest offers in the Canadian for a Visa and AMEX, respectively. Which cards are you planning to get? The 9,000 spend requirement is a task in itself.